This article was written for the UC IPM Retail Nursery and Garden Center News, a publication directed at retail nursery store employees. With the recent confirmed human West Nile virus deaths in California, it's important to understand how mosquitoes reproduce and what you can do to prevent them around your home or other areas. Do You Have Carpet Beetles in Your Home? Have you noticed small, rounded beetles that resemble miniature lady beetles crawling your home lately? If so, you may have carpet beetles. 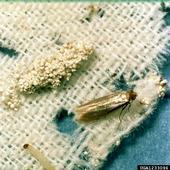 Carpet beetles can be pests in homes, museums, and warehouses, where they feed on food such as fabric, wool carpet and rugs, stored food, and natural animal products including furs, feathers, bone, silk, and preserved specimens.